Another year, another set of resolutions. Enclosed are my battle plans of 2013. I write them out more as service to myself. In the heat of battle, it's sometimes easy to forget what's important, and why are we even fighting, so this serves as a reminder. It's also a lifehack that helps me accomplish more because I feel at least somewhat accountable of what I said I would do. Every year when I step onto that airplane in December bound for home, I am somewhat saddened that it marks the end of the year, and there is nothing more I could do to change the outcome of the year. As I'm home, I recount stories of 2012 with friends and family, and I reflect on the year. The past informs the 2013 battle plan, so lets briefly dive into a recap of the major themes of 2012. One of the questions I keep getting asked was, "what on earth happened to you in 2012? You seem to have just blossomed this year." It was definitely a headline year, I learned more than I ever have, I met more people that I ever have, I travelled more than I ever have, I accomplished more than I ever have, I failed more than I ever have. It all started at the beginning of year when I was met with a number of disappointments. Rather than throwing a pity party, I just got annoyed (in a constructive good way). I vowed to prove all these people wrong, and nothing was going to stop me. I stopped caring what people would think, and I stopped chasing silly constructs like promotions or job security. Focus on being awesome, and doing the right thing, and the rest will take care of itself. Even if things didn't go well, at least I did the right thing because the journey is more important than the end. I broke out of the Matrix. 2012 was a year of reinvention and disruption. I had to fundamentally question everything. I spent a lot of time reading about leadership and philosophy which would lay the intellectual foundations. What is the right thing to do? Why do we operate the way we do? If we had no constraints, how would we lead? How would we change the world? I wrote this all down into a cultural charter, and it has become a useful compass to help navigate rough waters. A powerful lifehack that I employed was, what if the world was actually ending in 2012? That's when I realized how little I've aspirationally accomplished. By default, I plan way in the future, and forgo a lot of things in order to create a better future. That is fine for a while, but there comes a time when I realized that life was just passing by as I wasn't living in the present. With age, I started realizing, what if the future we were preparing for is right now? All those things that I put off, waiting for the perfect time to do it just ends up never happening. I realized there is no perfect time. The perfect time is now. I was watching video footage of my Hack Day pitches in Q1, Q2, and Q3. Looking back at Q1, and noticed what a nervous presentation I gave. My voice was shaky, I saw a scared person on stage trying to win over a skeptical crowd. By some miracle, that Q1 performance resulted in a double win at Hack Day which was unprecedented. I remember after winning that Hack Day, all these media folks were busy interviewing me and asking all these questions about what my day job was, and why was it awesome. I honestly felt like a fraud at that moment. Other than contributing the original idea, I hardly did much coding for the hacks. Honestly, my day job at the time wasn't awesome, and I was having serious doubts about the future of the company, and company morale was very low. What I realized though was that co-workers were watching this win unfold, and they were elated by what had happened. I decided, in these dark times, the team was in need of heroes, so be it, I'll have to pretend to be this champion. Fast forward to Q3 Hack Day, and as I watch my pitch, I think, wow that guy is confident, and he's a natural at this. That's when I realized, I had become what I was pretending to be. I was no longer afraid. After a long line of failures, and nothing to lose anymore, and everything to gain, there's nothing to fear anymore. I used to be fairly uncomfortable about posting photos of myself online. I don't know what the psychological term of this would be, but I used to always pick out some flaw about myself in the photo. The proliferation of photos on Facebook, and people tagging me in photos made it worst. But then something happened last year after my missions trip in Ecuador, I started becoming okay with photos of myself. That trip was one of the most spontaneous thing I've ever done, and it was way out of my comfort zone, but I pulled it off. Maybe it's a sign that I'm finally secure with myself, and I'm finally content with where I'm at in life. I finished my annual reviews last week, and my boss asked me off the record about this breakout year, what happened to you last year? I think I self-actualized. Efficient perceptions of reality. Self-actualizers are able to judge situations correctly and honestly. They are very sensitive to the fake and dishonest, and are free to see reality 'as it is'. Task centering. Most of Maslow's subjects had a mission to fulfill in life or some task or problem ‘beyond’ themselves (instead of outside of themselves’) to pursue. Humanitarians such as Albert Schweitzer and Mother Teresa are considered to have possessed this quality. Peak experiences. All of Maslow's subjects reported the frequent occurrence of peak experiences (temporary moments of self-actualization). These occasions were marked by feelings of ecstasy, harmony, and deep meaning. Self-actualizers reported feeling at one with the universe, stronger and calmer than ever before, filled with light, beautiful and good, and so forth. If 2012 was all about getting the ideas, philosophy, and culture foundations right, then 2013 will be all about execution. I viewed 2012 as a series of unrelated scrimmages and battles in the wilderness, which produced some fame and glory, but in the end, not really worth anything as fame and glory fades. I have scouted out new positions, and now is the time to consolidate everything I have learned and take on fortified cities that will yield decisive victories. It's time to turn these ideas into reality. "A siege is a military blockade of a city or fortress with the intent of conquering by attrition or assault. The term derives from sedere, Latin for 'to sit'. Generally speaking, siege warfare is a form of constant, low-intensity conflict characterized by one party holding a strong, static defensive position. Consequently, an opportunity for negotiation between combatants is not uncommon, as proximity and fluctuating advantage can encourage diplomacy." The metaphor that I'm using for 2013 is a siege. I have mapped out the lands I intend to conquer, but a large wall stands between us and victory. Constant attempts to breakthrough the wall will be required, and there will be many setbacks, but I have to try anyways. 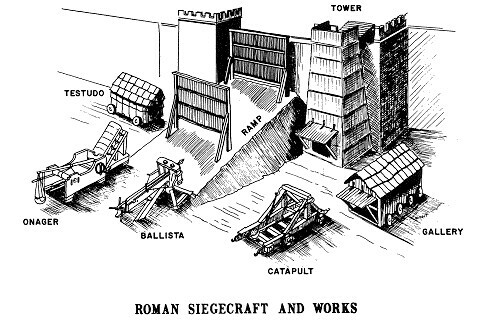 I particularly liked this metaphor because war engineers were called upon to build siege engines and incredible machines to breach defenses that normal armies could not overcome. I will be taking off the philosopher hat, and putting back on my engineering hat, and going back into the trenches with the team. I will be undergoing new engineering training in order to upgrade my skills, and contribute to the war effort. I like the definition of the siege in that it does involve diplomacy as well. I've been doing plenty of diplomacy and alliance building the last little while, so it's an apt definition. As part of the war effort, I'm carrying over the goal from last year of diversifying my holdings. To really move the needle, I'm going to have to open the war chests and write some big cheques to do some serious damage. I didn't manage to make any angel investments last year, but here's to trying again. 120 days ago, I lost my entire engineering team, and I've been fighting since to get them back. 60 days ago, I received the greenlight from the King for additional engineers to support my cause. 30 days ago, the King was dead and I didn't know if my reinforcements were coming. 14 days ago, mysterious engineers from the East appeared offering aid to my cause. That being said, my goal for the year will be to get an audience with the ruling Queen to gain proper legitimacy for the team. I grow weary of every quarter having people question whether this project I'm working on has the right authorizations, or if it's important. An audience with the Queen will hopefully answer those questions once and for all. If she deems the project as not important enough, then that's fine because that will free me up to raise funding for the next product on my backlog. This is the true beauty of having nothing to lose, and everything to gain. There is a constant cycle of death, life, and birth; we're just going to have to embrace this constant state of change. Dreams will die, dreams will be born, but as long as we keep pushing on, we'll be fine. "Someone asked the Swiss physician and author Paul Tournier how he helped his patients get rid of their fears. He replied, 'I don't. Everything that's worthwhile in life is scary. Choosing a school, choosing a career, getting married, having kids--all those things are scary. If it is not fearful, it is not worthwhile." - Philip Yancey, Where Is God When It Hurts? "What I really wanted was someone resourceful. But nobody knows what you mean when you say, 'I'm looking for a resourceful woman.' If I tell somebody I'm looking for a woman who can get me out of a Third World prison they have something they can hang their hat on! Life's too short to hang out with people who aren't resourceful." Moving onto the hope department, here's to the opportunities that are coming in 2013. Pastor Bret preached an amazing sermon at the beginning of the year entitled, "When Opportunities Knocks." A central theme is, what are we doing to prepare for moment when opportunity knocks. The first sermon I heard from Pastor Robert Stefani this year was entitled, "Standing Out." One provocative idea that he challenged us with was, "what you pray for reflects what you believe about God." I have that quote next to my desk as it reminds me to pray boldly. The final goal is to instill courage into others, and help break others out of the Matrix. The goal is to help self-actualize others. I was driving my friend Tony late from work one night, and I was mentioning how thankful I was that I had team members willing to jump in to help in my project even if I can't reward them with anything since I'm not a manager, and the odds of success aren't exactly great. Tony remarked, "what you're seeing here is your true army, they will follow you long after your project is over." That was a heartening idea. I'll end this blog post with this quote that I'm using as a gauge of success if I'm able to say this to myself.